Carrie Haddad Gallery is pleased to announce their new exhibit, Hudson River School of Women, featuring paintings by Jane Bloodgood-Abrams, Tracy Helgeson, Laura Von Rosk, Susan Stillman and Juliet Teng. The exhibit opens on November 3rd and runs through December 11th, 2011. To meet the artists, come to the opening reception on Saturday, November 5th from 6 to 8 pm. 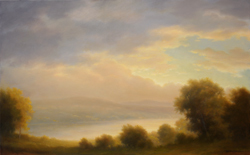 In her work, Jane Bloodgood-Abrams pays homage to the ethereal landscapes of nineteenth century painter George Inness, in which distant expanses of trees and sky are softly obscured by mist and fog. Layer upon layer of glaze makes these paintings glow. The hot light feels particular to late summer or autumn, except for in Spring Light, which lacks the humidity characteristic of her other work. Here, the artist lifts the foggy veil, revealing air that is tangibly crisp. She creates specific atmospheres that extend beyond the edges of her pieces, permeating the rooms in which they hang. Jane Bloodgood-Abrams has been exhibiting with Carrie Haddad Gallery for almost wenty years, and has a wonderful following in the Hudson Valley, as well as Massachusetts, California, New Mexico and even Europe. Her work can be found in several museums and numerous corporate collections. Tracy Helgeson’s landscapes emanate a warmth that comes from her crimson and burnt orange grounds. These fiery hues peek through each form, enlivening deep shadows and adding depth to cerulean skies. Ms. Helgeson lives in Fly Creek, New York, and exhibits in the Hudson Valley and Massachusetts. Juliet Teng also uses layering to compose her fantastical landscapes, but here this technique yields paintings that resemble tapestries. In Gold and Ruby-Lake Woods, magenta and chartreuse strips that define the space between tall trees recall pleated velvet. Teng organizes her compositions through repetition and symmetry--a strip of blue at the bottom of the image mirrors sky at the top. The compositions of Susan Stillman’s paintings are remarkably similar to Teng’s, though these works are much more representational: tall skinny birches, cushioned by leafy trees in the distance, span the length of her canvases. Stillman’s color is sensitive and specific. Light violet defines both the sky and the birches, and is heightened by ochre leaves. Stillman lives in Westchester and teaches at Parson’s School of Design. Laura Von Rosk interprets space differently, mixing visions from memory with emotionally charged imagery. Through this technique, she blurs the boundary between reality and the subconscious, creating intimate and voluptuous environments in which nature takes on bodily forms. Von Rosk lives and works in the Adirondacks. She has received a NYFA painting fellowship, and a grant from the Pollack-Krasner Foundation. She is currently doing an artist residency in Antarctica. Carrie Haddad Gallery is located at 622 Warren Street in Hudson NY. The gallery is open daily from 11-5, and from 12-5 on Sundays. Please call the gallery at 518.828.1915 for more information or directions. All works may be viewed on the gallery’s website: www.carriehaddadgallery.com.